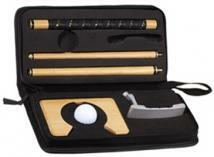 Kick back with a beverage and work on your putting stroke. Adjustable putting cup Part of the Montana collection. Material: 600D Nylon (ripstop) case, varied components Size: 12-7/8"w x 6-1/2"h x 1-5/8"d Imprint Area: Front (Standard): 4"w x 2"h, 4 color(s) max. Packaging: Bulk Pack Of: 26 Weight: 12 lbs. 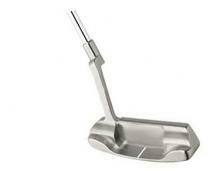 Wilson Harmonized Putter features a soft polymer insert double milled to be perfectly flat. True Temper steel shafts. Traditional head shape. Size: 3-3/4"w x 35-3/4"h Imprint Area: Back of Clubface (Standard): 1-1/2"w x 1-1/2"h, 4 color(s) max. Packaging: Bulk Pack Of: 1 Weight: 2 lbs. White Hot XG#1 with rounded heel-toe weighted blade and "crank neck" hosel and full offset shaft XG insert utilizes a multi-layer for phenomenal performance Available in both right and left hand Other XG putter models available Actual Size: 35" L Imprint Area: 1/2" H x 1/2" W Packaging: Bulk Shipping Weight: Approx. 25 lbs. per 12. 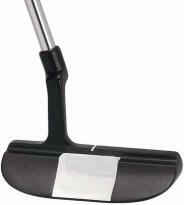 Welcome to the #1 putter in golf. 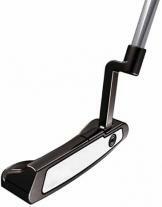 Round heel-toe weighted blade Crank-neck hosel and full-shaft offset. Size: 4-1/2"w x 35"h Imprint Area: Front (Standard): 3/4"w x 1/2"h, 4 color(s) max. Packaging: Bulk Pack Of: 1 Weight: 3 lbs. 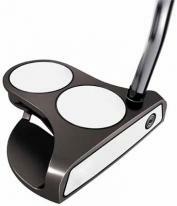 Welcome to the #1 putter in golf. Extended mallet head with a double-bend shaft and full shaft offset. Classic 2-Ball design. 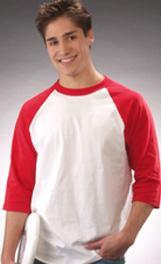 Size: 4-1/2"w x 35"h Imprint Area: Front (Standard): 3/4"w x 1/2"h, 4 color(s) max. Packaging: Bulk Pack Of: 1 Weight: 3 lbs. Inspired by industrial mechanical design and refined by Cameron Studio findings, the Studio Stainless putters feature an updated Newport style head. They are 100% milled from a billet of soft 303 stainless steel for a distinct sound, solid feel and greater durability. 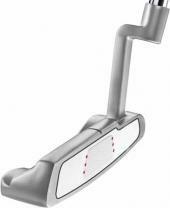 These putters are distinguished by their bright silver, satin buff finish, unique sole graphics and come with the popular Studio Design grip and atomic red head cover with pivot tool.